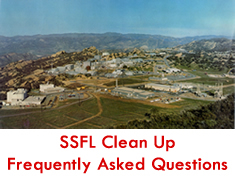 The Santa Susana Field Laboratory’s nuclear research legacy includes at least three nuclear reactor accidents, including the 1959 Sodium Reactor Experiment partial meltdown. Decades of accidents, spills, deliberately dumping and incinerating radioactive materials and waste have left a toxic disaster of extraordinary size and scope. Rocketdyne’s reckless handling of deadly chemicals including heavy metals, dioxins, PCBs as well as rocket engine solvents and fuel oxidizers, has left a toxic soup that has contaminated huge amounts of groundwater, plus contaminated surface water sluicing off the lab’s huge property into both Ventura and Los Angeles counties and vaporizing up through the soil.